Self love is something that never made any sense to me at all. Until last year, I understood the concept only intellectually, but didn’t really know what the big deal was. Suddenly I saw that a lack of self love was affecting all my endeavors. I didn’t really think that I was not good enough, but I didn’t feel a lot of love for myself. I put my needs second, third or even last, and if someone had an issue with me, I assumed I was at least 90% responsible. One day last year, I read that a person who has never experienced unconditional love or brilliant success, can have those feelings downloaded, using Theta Healing®. Once the person has experienced those feelings, he or she can attract experiences that resonate with the feelings. I decided I needed to know what it felt like to receive unconditional love, so I booked a Theta Healing® session to “download” this feeling. What a difference it made! All my interactions were changed. I felt more love for and from others. I also saw very clearly how all love in my life; given or received, originated in me. Self love is a keystone for enlightened interactions. Most importantly, self love helps you follow your life’s true path. Long before I experienced unconditional love through Theta Healing®, I had experienced an inner force which, while small, was totally invincible. I could drown out its message for a while, but not for long. I could ignore this force for a week, but not a month. This force was the drive to be authentically me. I drowned out the small soft voice of this inner force with intellectual chatter. (I spent many years of my life training my intellectual chatter.) I could talk myself into this or that course of action, but could not make them work because the force of this inner force made me feel bad if I did things were not in line with my authentic desires. This force speaks to us in feelings. You can tell in your body whether you are going the correct direction. You will feel free and easy if you are. You will feel resistance and irritation if you are not. Martha Beck calls this a sense of “shackles off” and “shackles on.” If you want to understand this concept better, just take a look at your list of things to do right now. See how each item makes you feel. I recently had a session with Jeannette Maw, who calls herself the Good Vibe Coach. Jeannette is full of good vibes and I felt better just hearing her laugh. After a long and detailed session, she said, “It’s easy. Decide what you want and then do what feels good.” My first thought was, “She’s insane!” But, since what I had been doing hadn’t been working too well, and Jeannette seemed to be happy and successful, I chose to think shw was taking her own advice. The first result of doing what felt good was a lot of free time. I was shocked at how many things on my “to do” list did not feel good at all. All the marketing activities I thought I must do to get business, made me feel like throwing up. I let them go, thinking I would never get clients, but strangely, feeling hopeful. Interestingly, the activities I did feel like pursuing resulted in four new clients who are very well suited to me. Oddly, slacking off like this, I’m getting better results in many areas of life. I was forcing myself to exercise, but I find that if I listen to my feelings, I will desire to get out and get moving on a fairly regular basis. Once, I forced myself to eat salads, following my feelings seems to result in a beautifully balanced diet over time, eating salad only when I really want to. Strangely, my feelings have led me to do some things that no one else understands and I’m trusting that those actions will also bring good results in the long run. If nothing else, they have created a “shackles off” feeling in the short run. Sometimes it seems emotions come at us out of the blue. You turn left on Main Street and are suddenly overwhelmed by sadness. What happened? An acquaintance asks how you are. Suddenly you feel annoyed. What’s going on? Emotional reactions that seem to come from nowhere are rooted in your unconscious. How in the heck did they get there and what can you do about them?When you have denied your feelings rather than simply feeling them, they can pile up in your unconscious. If you deny enough of them, perhaps because you do not want to own your negative feelings, they can even create physical symptoms. Everyone does this to some degree. Then, when you see a man on the corner who looks like the boyfriend who dumped you, or you run across an acquaintance who reminds you of your evil stepmother, you can suddenly be catapulted into reactions that don’t seem to make sense. We say these people or situations push our buttons, because of the automatic nature of our reaction, but this is a bit of a cop out. When I studied anatomy, humans didn’t have buttons. If they did, I would look for a reset button during these sorts of outbursts. You can create a lot more comfort and ease around these hot button reactions without lying on Dr. Freud’s couch (not that there’s anything wrong with that.) The trick is so simple you might not take it seriously. But I urge you to take it seriously and try it more than once. The trick is to simply experience the feeling. You won’t die from it. You don’t have to know where it came from, simply feel the feeling. In fact, the feeling will pass quickly if you don’t resist it. After you practice this a few times, you will notice your hot buttons being disabled, one by one. There are energetic ways of reducing the resistance and pain of feeling your emotions and making the process easy and rewarding. I call these techniques emotional alchemy because they transmute negative feelings like anger, sadness and fear into positive qualities like good boundaries, ability to release old issues, and heightened awareness. What these techniques do is increase the flow of emotions, so they flow right through the body and don’t stay stuffed in the subconscious. Emotions handled this way change almost magically from painful to neutral. Practice at properly handling emotions ultimately creates states that are positive. We have emotions for a reason. They give us important information. When we get the message, the messenger goes away. Just as my grandma’s letters came with a dollar bill tucked inside, the messages of emotions also come with gifts in them. When you experience good boundaries and let go of old business, you are then present and aware. You cannot be present and aware for very long before you find yourself feeling joy. To those of you who do experience chronic pain, check out The Mind Body Prescription by John Sarno, M. D.
Fear seems to be one of the least helpful feelings when you are doing something new. If that something new involves alligator wrestling, fixing a gas leak, or dating a notorious gangster, then your fear will help you stay alive.Most of us experience a different sort of fear that seems attached to unlikely events or events that do not really threaten us. We worry enough about saying the wrong thing at a meeting that we don’t notice the mugger in the alley. I laugh when I think of the driven students at my university during exam time, who were so afraid of failing, they would read their note cards while crossing State Street in front of Mack trucks. When we examine this sort of fear, we tend to dismiss it as groundless. The trouble is, it doesn’t stay dismissed. It often has a message that is just as valid as more obvious seeming fears. Finding the message can be the solution. For months I woke up with a feeling of fear I didn’t understand. After my teacher advised me to meditate on it and ask it what it wanted, I discovered that I was afraid I would never find the courage to pursue a cherished goal. After I got the message, the messenger finally went away. Getting the message can take a while. Meantime, you can energetically transmute fear and feel better right now. Fear is an energy in your body. You can change the energy in your body by simply thinking about it in a different way. 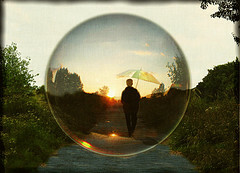 Imagine your body is surrounded by a bubble of light. Now imagine that because you are fearful, you make the outer wall of that bubble extra strong and thick, so nothing can get to you. Also imagine that the bubble is big enough to enclose your body comfortably. You have now effectively channeled fear energy out of your body into protective but not restrictive boundaries. Why do we call it brainwashing when it clutters the mind? We all tend to think the thoughts in our minds belong to us alone. When we start looking at them carefully we realize how often other people leave their stuff in our space. How free are we really? Most of us have mental and emotional instruction manuals from our moms, pictures of what we should look like, rules for social engagement, and notions of good and evil. Some of that information was put there by our parents for our own good, but is probably long past its expiration date. Some was projected onto us by institutions or employers who want us to behave, again, for our own good. But we may not have examined who really benefits from our behaving as prescribed. What is troublesome is the information we accept from others that keeps us in the personal control of a partner, friend, parent or other relative. Love is supposed to support what is best for the loved one, but in truth, most of us have insecurities and want others to help fulfill us in some way. Even though I have been making distinctions between thoughts which are mine and not mine, I was shocked to discover recently, that I had subscribed to a belief that belonged to a family member. I had not really examined it to notice that it wasn’t mine. This belief made me responsible for a fellow adult’s continued existence, so it served him well to leave it in my space like a cuckoo’s egg, where I would nurture and cherish it as my own. Then one day, someone pointed out to me that this belief did not make sense and did not look like any of my other thoughts. I felt positively illuminated! I also felt intensely relieved to absolve myself from a responsibility I coudn’t fulfill. Life became much easier. Once I got rid of the cuckoo egg, I was able to hatch some of my own creations! Of course, the thoughts of others don’t affect us unless we buy into them in some way. Our buying into them camouflages the foreign thoughts so finding them is like a find-the-hidden-object-in-the-picture game, but it is a game worth playing. The more we release other people’s stuff, the more room we have for our own creations. Put more plainly, we will more often have experiences and things that we want. We are always taking in information from others, but it is possible to distinguish that which controls you. When an idea or belief seems to really tie you down, then it is one to examine. Sometimes it is appropriate to be tied down by, say, caring for small children or aging parents, or being responsible to a job you wish to keep. But sometimes the thoughts that tie us down do not stand up to scrutiny. Will the sky fall if you don’t do what your partner demands? Will your children really be happy if you give in to their every whim? Will your mother die if you do not drop everything to visit her this Saturday? Often, all that is needed to deal with insidious control thoughts is to notice them and they start to untangle and release. However, an abusively controlling person will often mete out unpleasant punishment those who refuse to be controlled. So, if you are in a seriously controlling relationship, you may need to get help dealing with other’s thoughts. The best kind of freedom is freedom of thought. At least I think that’s what I think.